Gary Szatkowski is the Meteorologist-in-Charge at the National Weather Service Office in Mt. Holly, NJ. As we roll toward the end of the week and eventually find out what Mother Nature has in store for us regarding the upcoming storm, it’s easy to get focused on snowfall amounts and forget some of the other significant impacts of a major coastal storm. But even when you do think about the other impacts (coastal flooding and wind), it’s still easy to keep the impacts separate, treating them as individual parts of a complex storm. And when you do that, you risk missing the societal impacts aspect of the storm, and the danger that brings. 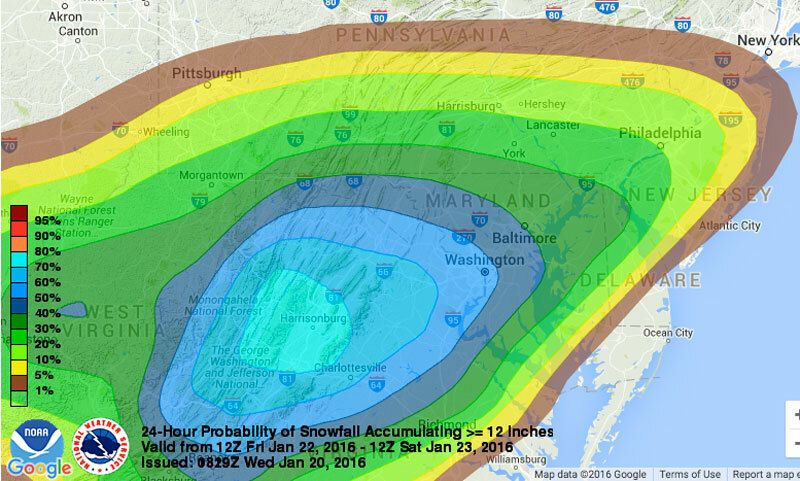 Percent chance of 12 inches or more of snow by Saturday afternoon. 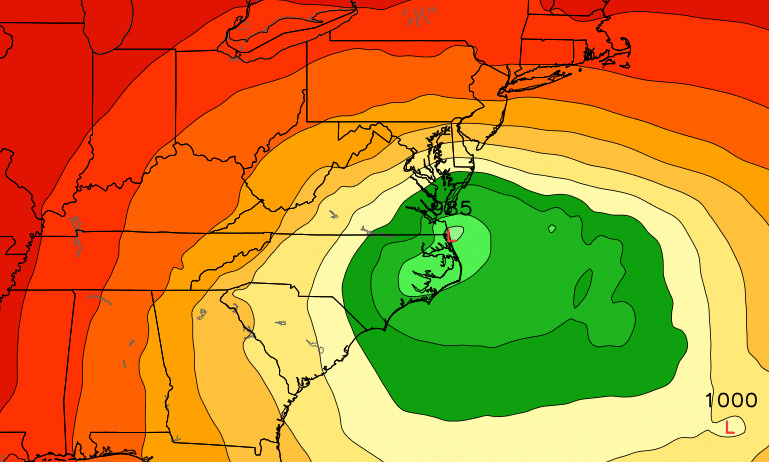 Our weekend storm presents such complexities, and will punish those who don’t fully realize what may happen. Right now, it looks like the first high tide to worry about — bringing the risk of major coastal flooding — will be right around sunrise Saturday. Bingo, danger! This means water levels will be rising rapidly during the early morning hours Saturday, while it is still dark outside and while most people will be sleeping. The first sign of problems may be when water enters a residence and people are faced with an imminent evacuation decision when they awaken. Now, the winds. Winds may be gusting to 60 miles an hour along the Atlantic Coastal beaches of New Jersey and Delaware during the early morning hours on Saturday. Anyone venturing outside will have to deal with those wind gusts, including the potential of blowing debris, as well as tree limbs and power lines which may have been brought down. People driving in the dark, along flooded roadways, may find tree limbs and power lines (possibly submerged) along their path. From a societal impacts perspective, some very dangerous conditions may persist. By changing the scenario timing, and leaving everything else the same, you can see substantially different risk perspectives. If high tide happened in mid-afternoon, and the winds rose during the day, people could see the water levels as they rose, and could also see the beginnings of any wind damage. And they would be awake, not startled out of sleep in the middle of the night. 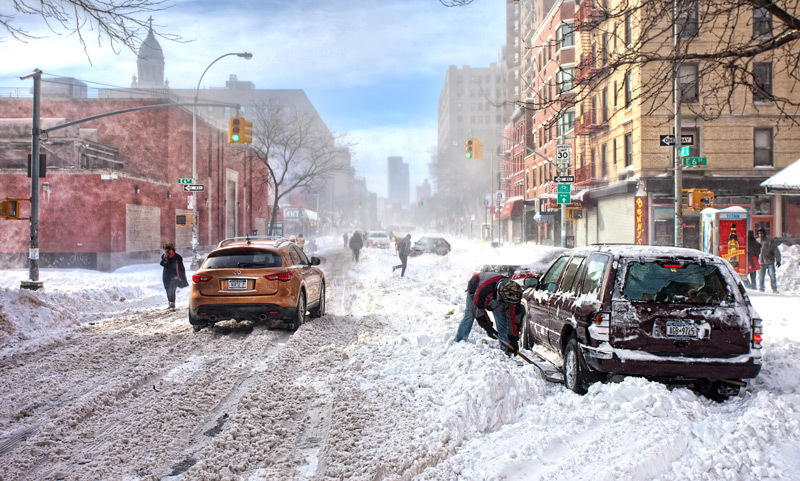 People in this scenario would be more likely to choose to safely evacuate before roads became impassible, and would be much more likely to perceive and avoid hazards along their evacuation route. 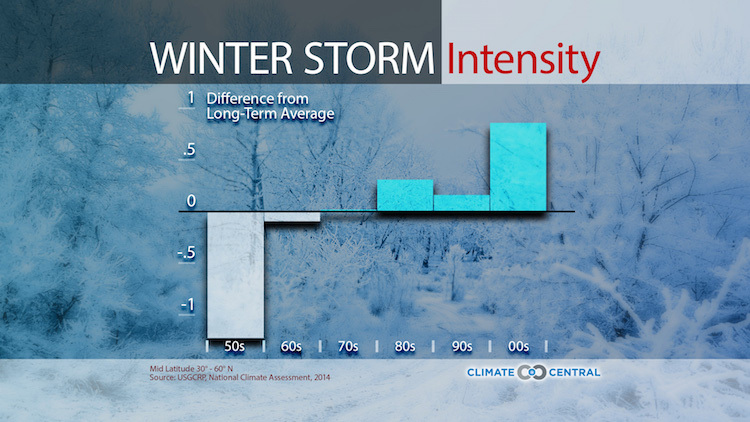 Things far removed from traditional weather forecasting can directly impact the mission to protect life and property. As weather forecasting continues to improve, the amount of information that can be leveraged to make good decisions also improves. Improved accuracy in forecasting allows us to pivot to assessing the societal risk of those weather elements and making sure that key points are communicated clearly. Accurate information conveyed in a timely manner, with a focus on what matters most to people, is a recipe for a level of service where the sum is greater than the parts. En garde, Mother Nature! Maybe you saw the maps making the rounds on Twitter and elsewhere on the web: “Snow!” some shouted. Inches of it blanketing the Northeast this weekend, thanks to a brewing storm. Maybe you also saw the responses from seasoned meteorologists warning those projections should be taken with a healthy grain of rock salt.